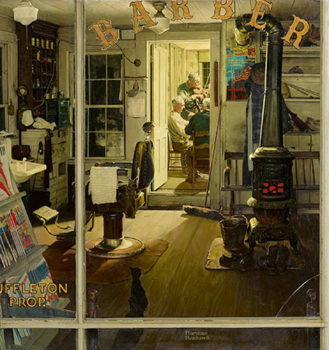 In February, when the embattled Berkshire Museum in Pittsfield, Massachusetts, announced it had reached an agreement with the state’s attorney general to sell as many as 40 works from its collection, the juiciest detail was that an undisclosed institution had agreed to purchase and exhibit the lot’s most valuable work: a Norman Rockwell masterpiece titled Shuffleton’s Barbershop (1950). Speculation in the wake of the news was that the likely buyer was one of two robustly funded institutions: the Lucas Museum of Narrative Art, founded by movie director George Lucas and set to open in Los Angeles in 2022, or the Crystal Bridges Museum of American Art, in Bentonville, Arkansas. Now the suspense is over. Today, the Lucas Museum disclosed that it is the mystery buyer of Rockwell’s painting. A spokesperson for the museum said it would not disclose the price paid for the work, which was donated to the Berkshire Museum by Rockwell himself. When the painting had recently headed to the auction block before a blocked sale at Sotheby’s in New York, the auction house estimated it could fetch $20 million to $30 million. That sale was halted in the face of legal challenges, which were exhausted only last week. Yesterday, the museum said it would send 13 works to auction with the aim of bringing in a total of $55 million to bolster its finances and improve its building. As part of the purchase agreement surrounding the Rockwell work, the Lucas Museum will loan the painting to the Norman Rockwell Museum in Stockbridge, Massachusetts, until sometime in 2020, with the possibility of also loaning it to other museums in Massachusetts and further afield, before it goes on view at the completed museum. Lucas, the creator of the Star Wars movie franchise and the director of films including American Graffiti, is a serious Rockwell aficionado. In 2010 the Smithsonian American Art Museum in Washington, D.C., hosted an exhibition of Rockwell works in his collection and that of fellow director Steven Spielberg. In 2013, Lucas purchased Rockwell’s painting Saying Grace (1951) at Sotheby’s New York for $46 million, a record for the artist at auction. Norman Rockwell, Shuffleton’s Barbershop, 1950 has been acquired by the Lucas Museum of Narrative Art, due to open in Los Angeles in 2022.